Welcome to the Creative Cuts and More Blog Hop, I'm so happy you stopped by! Today we're celebrating the launch of Creative Cuts and More’s brand NEW website! The Celebration Blog Hop starts at the Creative Cuts and More Blog, it you didn't start there, you'll want to head back to read the details on how you can enter to win 1 of 5 Creative Cuts and More Gift Certificates. Also, for one week only, all new die cuts in the Creative Cuts and More store will be on sale for 10% off! 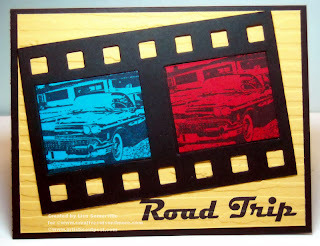 I created a few projects today using some of the die cuts available at Creative Cuts and more. 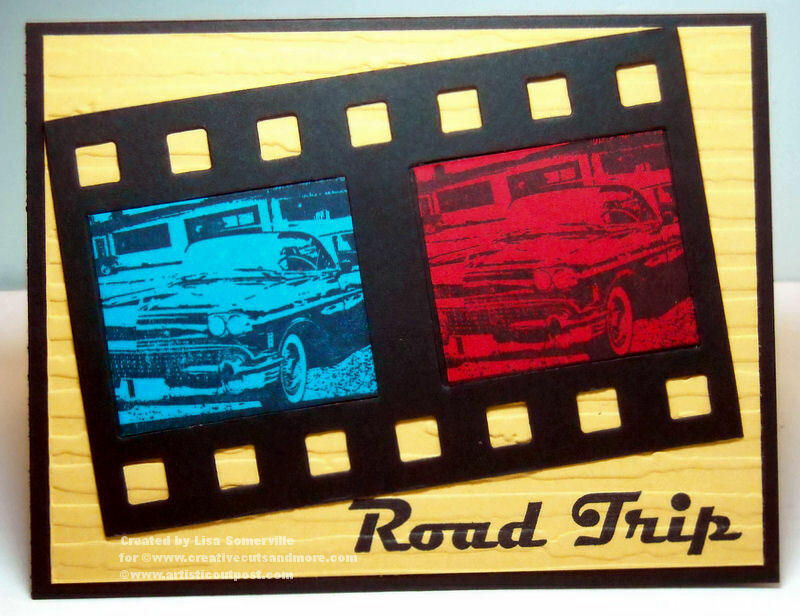 First up in this fun Retro card using images from the Artistic Outpost Route 66 plate and the Small Film Strip Die Cut from Creative Cuts and More. These images make for a great masculine card, or they'd be perfect used as a scrapbook layout. 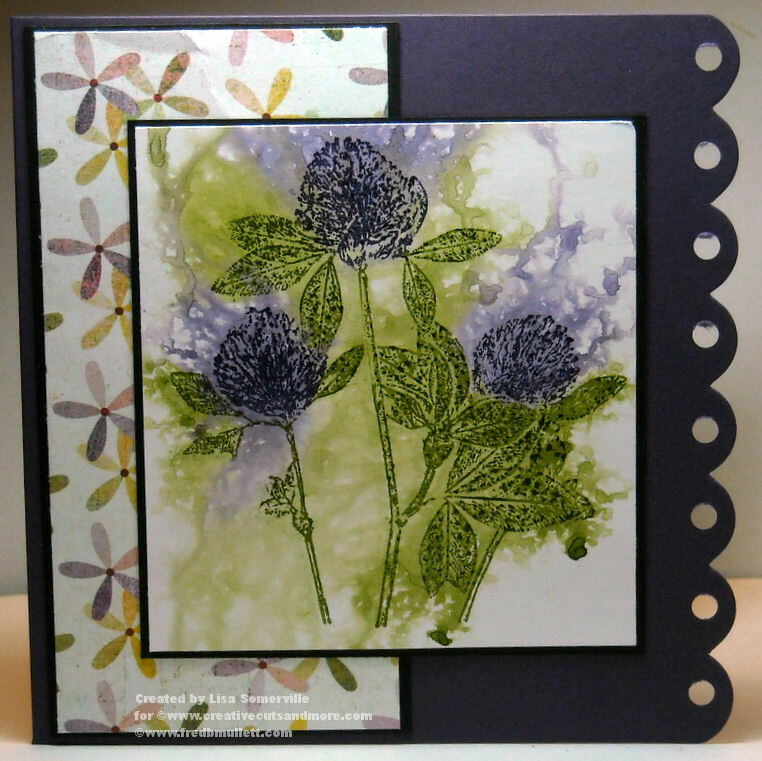 This next card using the 5-1/4" Square Scallop card in Eggplant Elegance. I used a Crop-a-Dile to punch holes in the scallop edging. The beautiful clover image is the Big Clover Group (BG-071-0) from Fred B. Mullett. To make the clovers a little more artsy looking I used the Expressionistic Watercolor Technique,but instead of using a Spectrum pad, I used markers. My last project uses the Tuck Top Cube Box in Hot Chocolate, isn't this just the cutest little box! I simply added some card stock layers in Crushed Curry and some Basic Grey Origins paper and tied on a Chocolate Satin Bow using my Bow Easy. Thanks for stopping by, your next stop on the hop is Silke's Blog. Beautiful, fun projects Lisa! The film strip is really great, and then of course there dis that beautiful flower card, and oh yea, the die for box! Gorgeous card and LOVE the box! What fabulous projects, Lisa....the film strip card looks sooo awesome and I love the beautiful flower card!!! The little box is adorable, too!!! Wow! Great creations! I love the scallop card & the box is too cute. Fabulous group of projects for the hop, Lisa! Too much fun! Wow the box is great and the film strip is such a neat idea! Love your projects, Lisa!! The little box is adorable! love the card and the box! Ohh love the film strip! That turned out COOL! The card is LOVELY and the box - I just LOVE the origins paper - FABULOUS work!!! What a great showcase of projects...Love the box!!!! Very cute cards and box! Fun stuff!!! Love the "Film Strip!" Great projects. I love the box! Great Projects Lisa. Thanks for sharing! Love the background behind your clovers! Lovely cards and box. 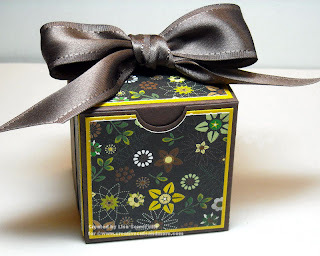 Lisa thanks for sharing I absolutely love that box, very pretty!! Great projects! I really like the filmstrip idea. Your clover card is so lovely!